It's day 3 of the i3 conference held at Robert Gordon University, Aberdeen, Scotland. I chaired a session first thing, so this and the next post are not liveblogged (as I needed to give attention to my duties as chair!) but I took notes, which I've tiedied up (but not radically revised). Firstly, Michael Olsson talked on Making Sense of the Past: the Information Practices of Field Archaeologists. Olsson focused on practices by which participants make sense of artefacts and archaeological sites: using an information practices approach (which focuses on the social context rather than on individual behaviours). In doing this he also felt he was studying the process of how something becomes a document or information. There has been quite a lot of scholarly discussion about what constitutes a document (and a great deal about what is information!). In this research, Olsson came to understand the archaeological site itself as a document: the artefacts and structures found in it need to be understood in the context of the site. However, that context can be lost when the individual items are focused on and documented. Olsson defined an artefact by showing pictures of various objects such as skulls or bracelets, but identified that most of the artefacts on the sites he was investigating looked like grubby bits of stone. Also, for example, unusual mud (containing, say, remnants of food) could count as an artefact. He had carried out his fieldwork in Orkney (the Iron Age Cairns Project and the Ness of Brodgar Neolithic site): prehistoric sites where there are no written records, so “artefacts are the only documents”. Olsson focussed on embodied practices, with information and knowledge involving the bodies of the people at the site. His methods for this study were ethnographic observation, interviews (sense making and conversational) and discourse analysis (of field notes, websites etc.). Olsson pinpointed the critical moment where something is discovered in a trench, and a decision is made about whether to put it in the finds tray (at which point it becomes a document, a focus for information) or to put it on the spoils heap. Decisions about whether to select or discard are made based on personal expertise. There is a hierarchy of expertise (volunteer /trench leader /finds expert /site director). This sense making practice was embodied i.e. decisions were made on the look, feel and even taste of the item. Olsson gave the example of how you could tell something was a tool when you took it, and felt how it fitted in your hand. A key point overall was that in making decisions about what an artefact was and whether to select it or not, people did not refer to outside information sources, and they did not tend to use technology: the information was gathered through bodily interaction with the artefact and the application of people's expert knowledge and experience. 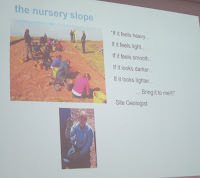 Part of learning to become an archaeologist was serving an apprenticeship where you got your hands dirty (literally) and learnt these practices (see the slide from his presentation, above).